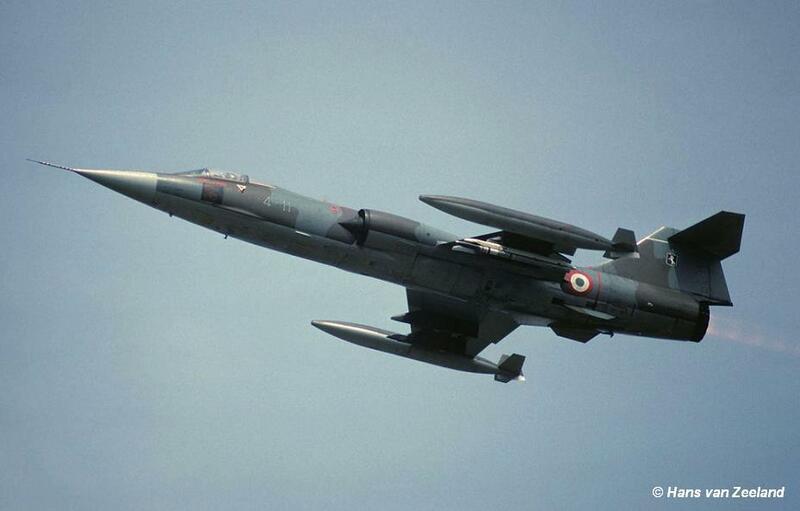 This month the Royal Air Force 19 Squadron, based at Wildenrath, flying the Phantom FGR.2, exchanged with the Italian Air Force 9 Gruppo based at Grosseto, flying the F-104S. It was a two-way exchange. Italian Starfighters noticed at Wildenrath were TF-104G MM54235/4-31 and F-104S/ASA MM6729/4-02, MM6763/4-11 and MM6828/4-6 and support by C-130H MM61993/46-07. Aircraft 4-31 and 4-11 landed on April 18th and 4-02 and 4-6 landed one day later. 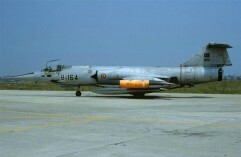 A number of weeks earlier, on 23 February 1990, a pre-visit was made by F-104S/ASA MM6733/4-22 and MM6763/4-11. The fact that aircraft MM6729 was coded "4-02" instead of the usual "4-2" was to the fact that it was recently reassigned to the squadron. A few months later this aircraft was lost. Beneath some photos taken during the exchange at Wildenrath thanks to Hans van Zeeland. This month the Spanish Air Force 111 Escuadron (ALA 11), flying the Mirage IIIEE from Valencia, exchanged with the Italian Air Force 10 Gruppo based at Grazzanise, flying the F-104S/ASA. It was a 2-way exchange. Sadly no Starfighters have been identified. 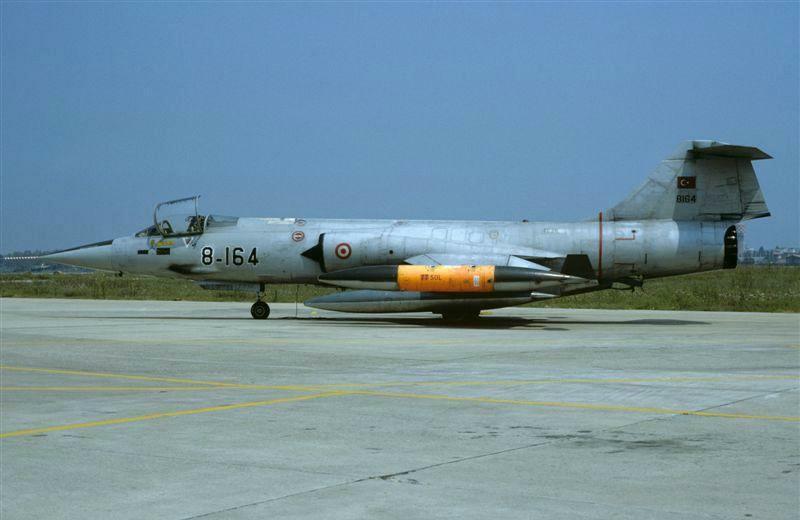 This month the Hellenic Air Force 347 Mira, flying the A-7H from Larissa, exchanged with the Italian Air Force 22 Gruppo based at Istrana AB, flying the F-104S/ASA. It was a 2-way exchange. This month the German Navy MFG2, operating the Tornado IDS from Eggebek, exchanged with a Hellenic Air Force F-104G squadron at Araxos. It was a one-way exchange, only the Germans flew to Greece. 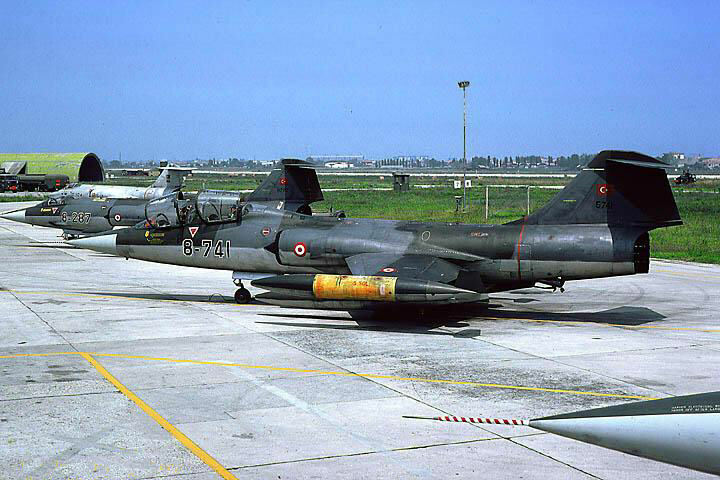 This month the Turkish Air Force 181 Filo, based at Diyarbakir, flying the ex German F-104G Starfighter, exchanged with the Italian Air Force 102 Gruppo based at Rimini, flying the F-104S/ASA. It was a 2-way exchange. 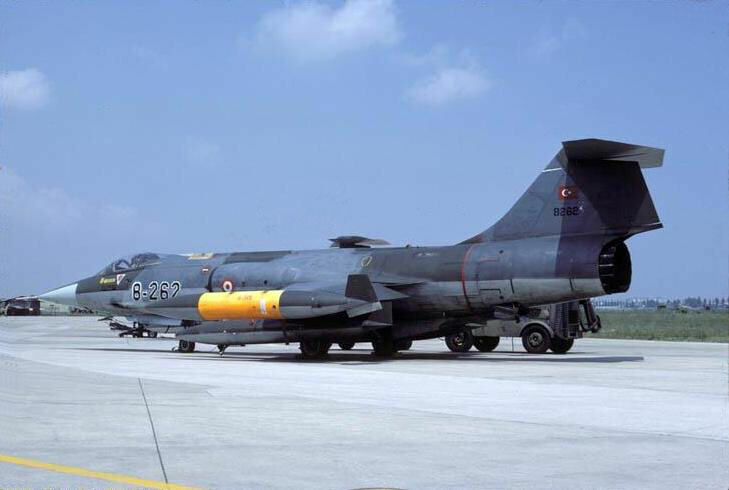 Aircraft seen at Rimini were F-104G 8164/8-164, 8262/8-262, 8284/8-284, 8287/8-287, 8290/8-290, 8346/8-346 and TF-104G 5741/8-741, 5905/8-905. 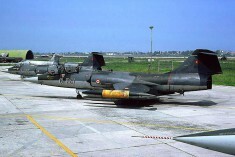 beneath a few aircraft seen on the Rimini flightline including the overall light grey 8164. This year the Danish Air Force 725/729 Eskadrille, based at Karup, flying the normal and recce version of the (R)F-35 Saab Draken, exchanged with the Italian Air Force 28 Gruppo based at Villafranca, flying the F-104G. It was a two-way shifted exchange where first the Draken aircraft flew to Villafranca in June and later the Starfighters were seen in Denmark in August. This year the German Air Force JBG35, based at Pferdsfeld, flying the F-4F Phantom exchanged with the Italian Air Force 18 Gruppo based at Trapani-Birgi, flying the F-104S/ASA. It was a two-way exchange. 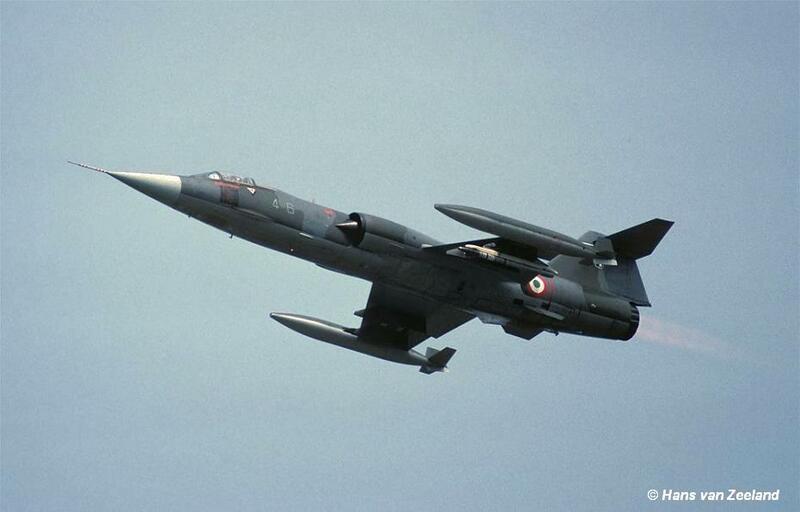 At least the following two F-104 Starfighters were seen in Germany : MM6836 code 37-04 and MM6840 code 37-25. The other two participating Starfighters have not yet been identified. Note: The known codes have not yet been 100% confirmed. 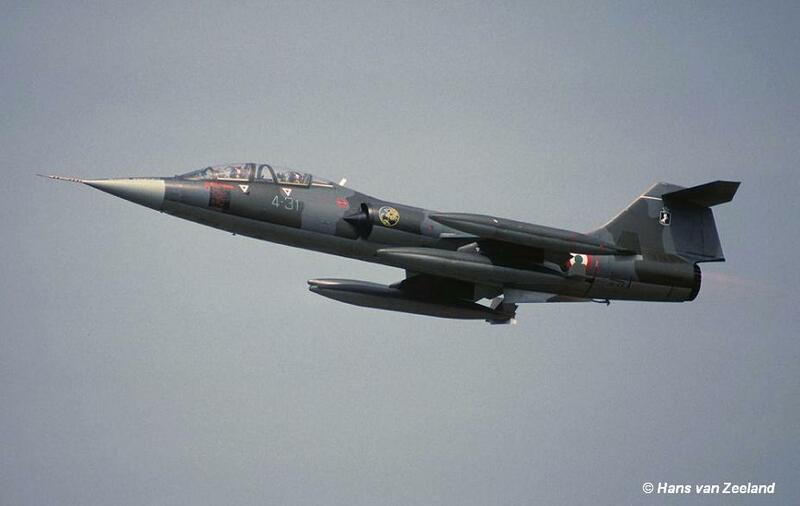 This year the Hellenic Air Force 341 Mira, flying the F-5A from Nea Anchialos, exchanged with the Italian Air Force 12 Gruppo based at Gioia del Colle, flying the F-104S/ASA. It is unknown if it was a 1 or 2-way exchange.